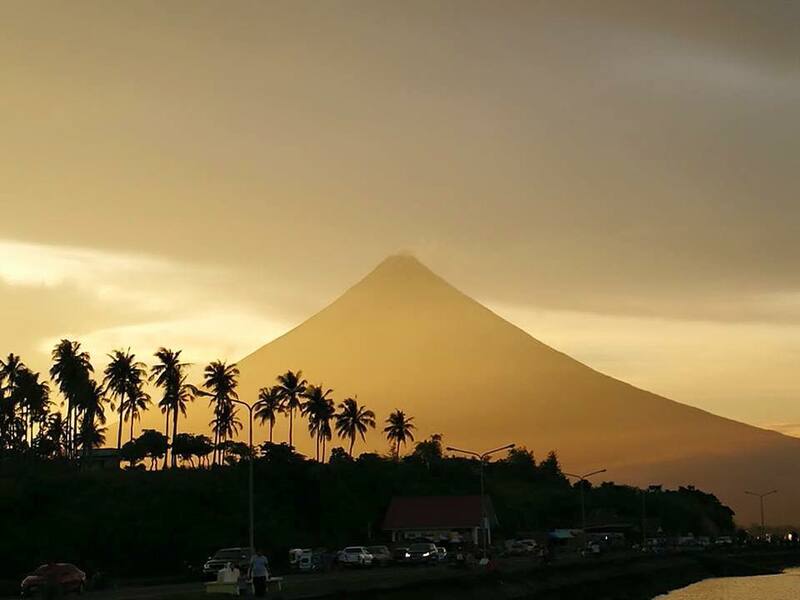 hotels in legazpi | Fly Me To Mayon! At a time of Airbnb and backpacker hotels, the pull of big, grand hotels is getting weaker – and the reasons are obvious. People care less about luxury and care more about value for money and how a hotel can help them have a great time in their destination city. So next time you book a hotel, choose a smaller one that can deliver the comforts of a typical hotel minus the high costs and the seemingly detached service many bigger hotels are known for. Because of its small size, boutique hotels are often squeezed in right smack in the middle of a city you fancy. Location is very important in hotel selection. 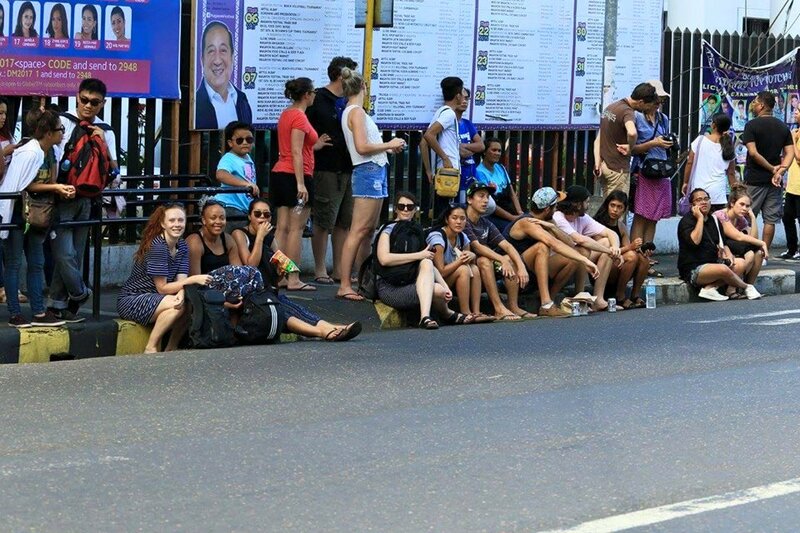 You just can’t afford to not enjoy the sights and sounds of a city because your hotel is tucked in a remote area with very limited transportation options, or too far you cannot just stroll around and get to know the place right when you go out the door. 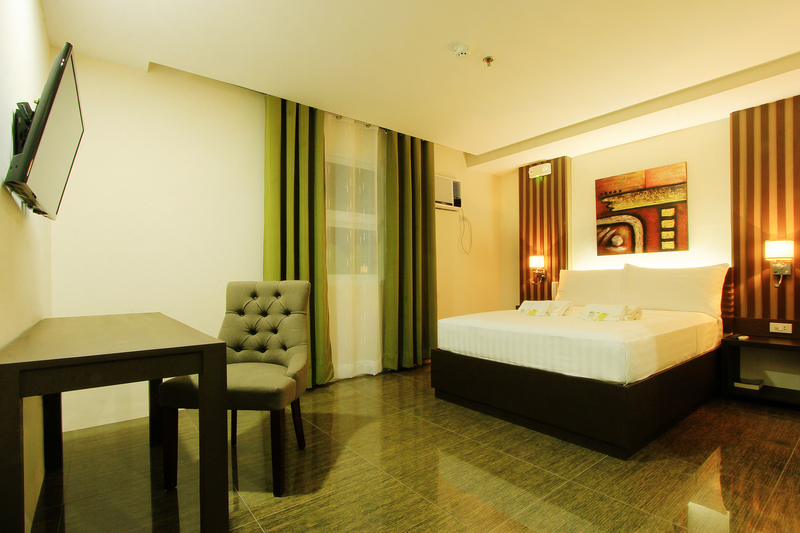 Emerald Boutique Hotel is right in the middle of Legazpi City. When you decide to eat local food you are just a short walk to the nearest Café. Location matters so when you book a hotel, Google it and find out how close it is to the heart of the city. Boutique hotels do not need to be very rigid with its service processes. Most of its people would be willing to multitask just to please a guest. You can easily talk to the Chef and ask for some special additions to your ordered food. You can ask for small favors from the staff and there would be no need to formalize that request and then get delayed with service protocols (like in big hotels where services are very structured). This makes small hotels very intimate when it comes to delighting guests. If you stay for three days it would feel more like a home than a hotel and you know everybody already from the housekeeping staff to the waiter in the charming restaurant downstairs. Contrary to popular belief that small hotels lack the refined service of grand, luxury hotels, what it lacks in grandeur it makes it up for quick, reliable, and personalized service. While it is good to make your vacation as affordable as possible, you have to remember that the quality of your sleep will dictate the overall experience of your vacation. It is easy to be a cheapskate and stay in very affordable hotels and inns but if you do this there is a big chance you will regret it later – plumbing does not work, the room is too humid (no air-conditioning), bed is uncomfortable, awful smell inside, and many more “issues”. 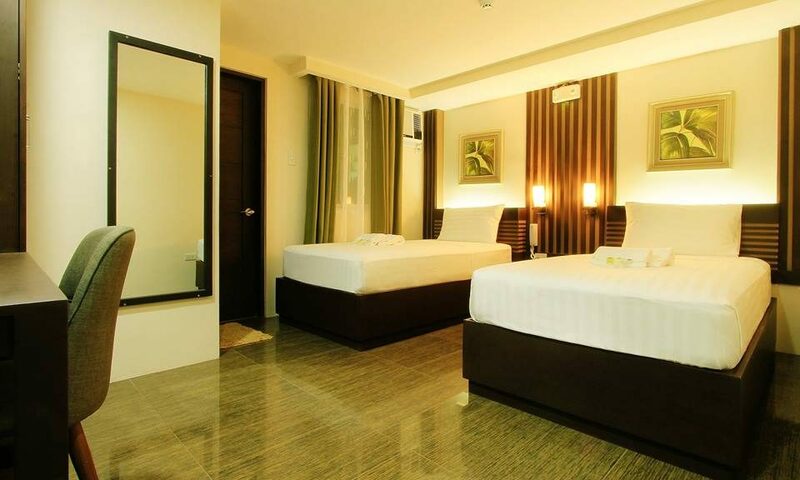 Staying in a boutique hotel, though priced higher, can give you the best experience with its air-conditioned room, very comfortable beds, and simple yet very nice rooms with amenities that you need and want for a comfy stay. At Emerald Boutique Hotel we go beyond what people expect in a small hotel. We have 5-star hotel quality mattresses, well maintained and brand new rooms, cable TV, fast Internet connection, an impressive menu at our restaurant, and many more things that can surely impress you. 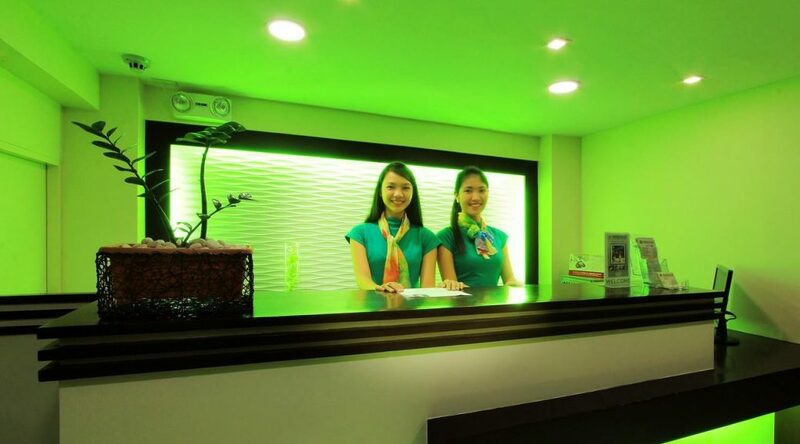 If you plan to visit Albay or the Bicol Region, Emerald is a very good hotel to book in. 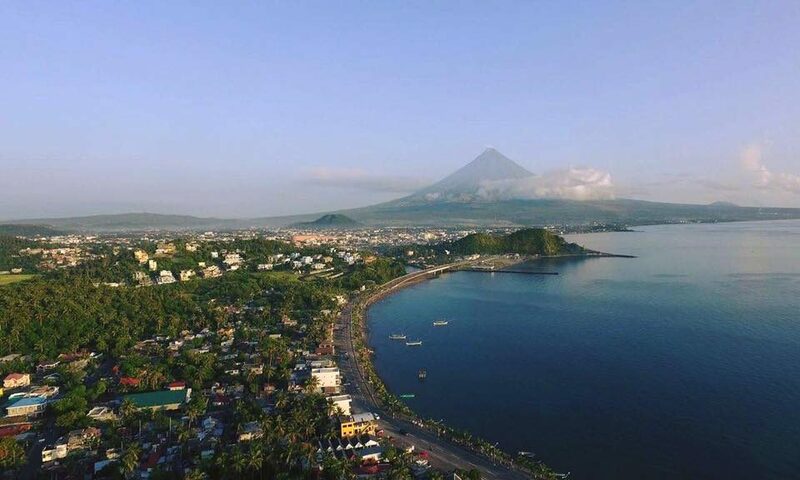 Our location is an ideal jump-off point to the many tourist attractions in the Albay and Sorsogon provinces in Region V. Visit our website at www.emeraldboutiquehotel.com or like our FB page at www.facebook.com/emeraldhotellegazpi to know more. See you soon! Emerald Boutique Hotel Launches Its Website! 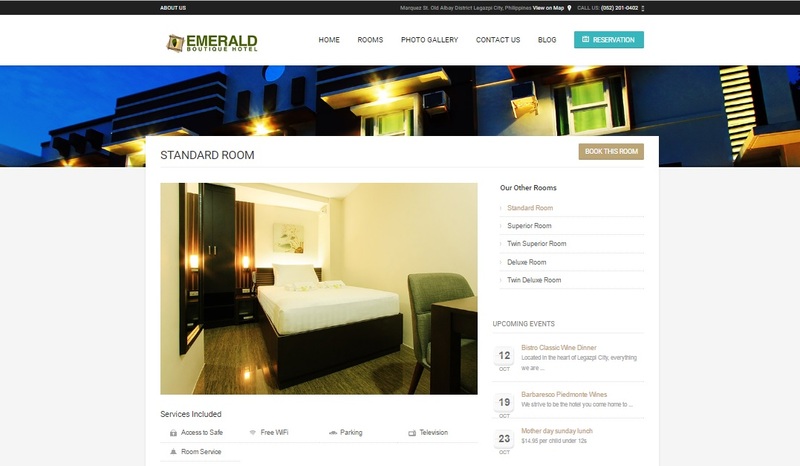 Emerald Boutique Hotel finally launches its website after 3 months of construction by a Legazpi –based web development company Betterment Solutions with the support of online branding think tank Kim Iqs. Emerald’s website is made to be simple and easy to navigate, a feature that will make it user friendly and at the same time browser friendly. Emerald’s website is easy to navigate, a feature that was intentional right from the very start to help guests interact with the hotel with zero fuss. Due to the simplistic design of the website it is also light enough for web browsers to load. This makes the online front of the hotel more accessible– even for people with very limited Internet speeds. 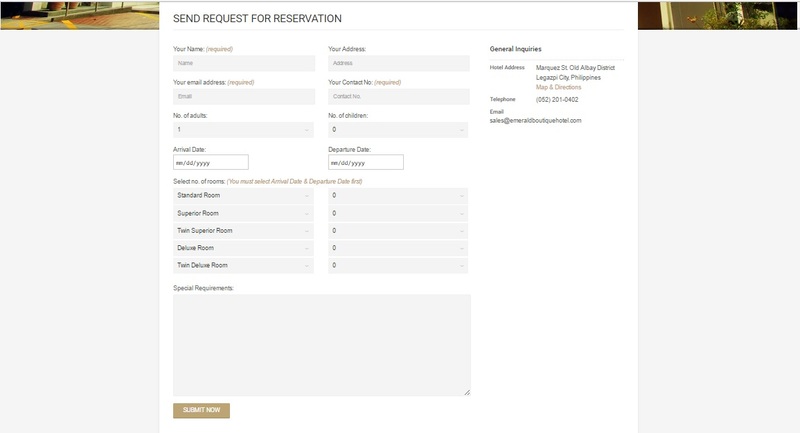 The website also has an online booking function allowing guests to book any rooms they want with a click of the mouse. Reserving a room is also very easy – just select your check-in date, enter your personal details, choose your preferred room, let the hotel know your special requirements (if there are any), and click “submit now”. You will receive a confirmation of your reservation. All you have to do is settle the cost of your booking and you are all set! Reserving a room at Emerald is now very easy. Just fill up the necessary fields, hot “submit now” and the room is yours as soon as you settle the fees. It’s as easy as 1-2-3. The website also makes it easy for guests to contact the hotel. Do you need directions to the hotel? Click the CONTACT US tab and find your way through Google Map. Do you need to call the hotel? Get the contact numbers from the same tab and get in touch with the hotel’s front desk personnel. You need directions? The Contact Us tab will help you find your way to the hotel with Google Maps. Other contact details are also included in this page. Hotel features are also part of the website’s home page content making it easy for guests to know what to expect while staying in the hotel and what they can do while checked in. Do you want to get updated with the hotel? Are you interested with the hotel’s special offers? Subscribe to their quarterly newsletter (enter your email address, click subscribe). Room details and descriptions are on an easy to interpret format with the use of icons and concise wording. You can easily choose between the rooms with a “book this room” button conveniently located on the right side. With the hotel’s improving online presence and its affiliation to many hotel directories like TripAdvisor and Booking.com, the launching of its website would make its online marketing efforts more visible. 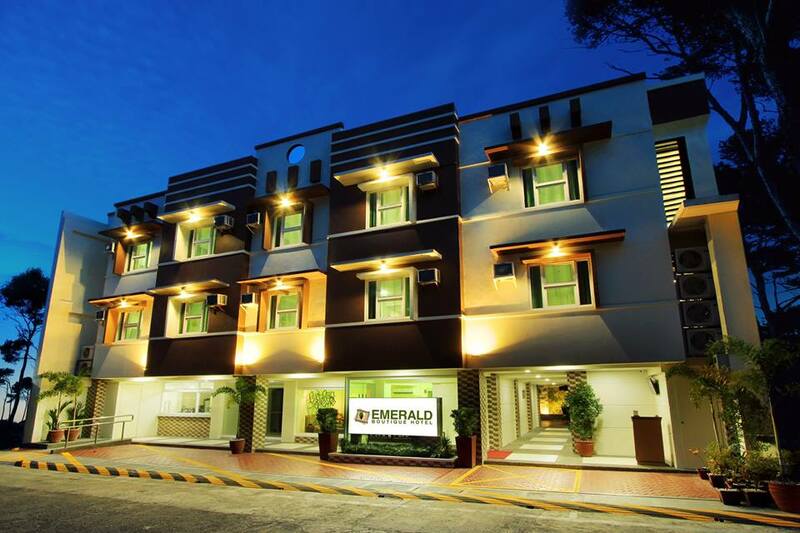 Curious about Emerald Boutique Hotel’s new home in the World Wide Web? Go to www.emerladboutiquehotel.com and check it out for yourself. 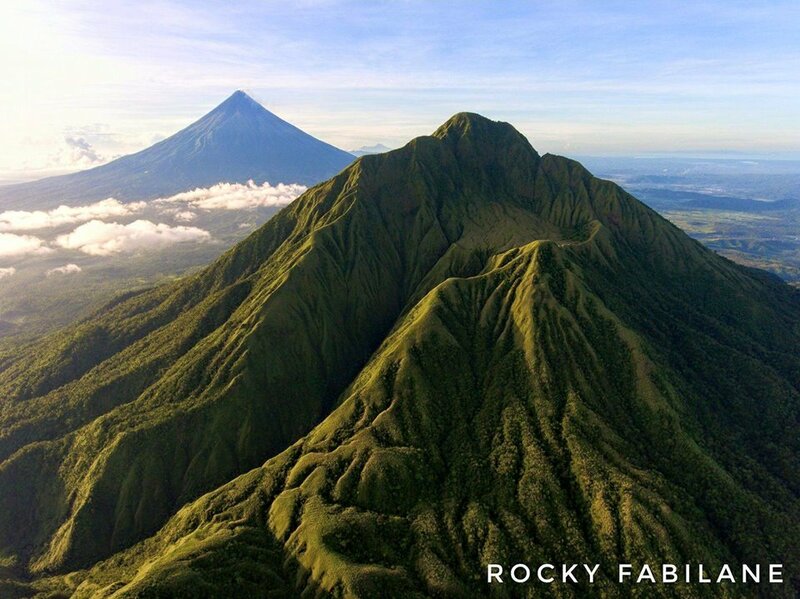 2016 is a promising year for local and visiting foodies in Legazpi. The food industry in the city is bound to get more interesting as local foodpreneurs are getting bolder in offering their gastronomic creations to the eager public. I am listing 4 new places to eat in Legazpi and I hope you can find the time to visit each one and tell your friends about your experience. This resto-diner-bar watcamacallit is an interesting place to dine. For one its interior is very unique. The owners of the place seem to maximize the physical features of the building they leased for the diner and went ahead with rustic-chic décor. Retazo Diner is so full of personality that eating here is almost irresistible. Good food and good music can be expected here. Owned and managed by musicians, this diner is not only about good food but most especially about good music. 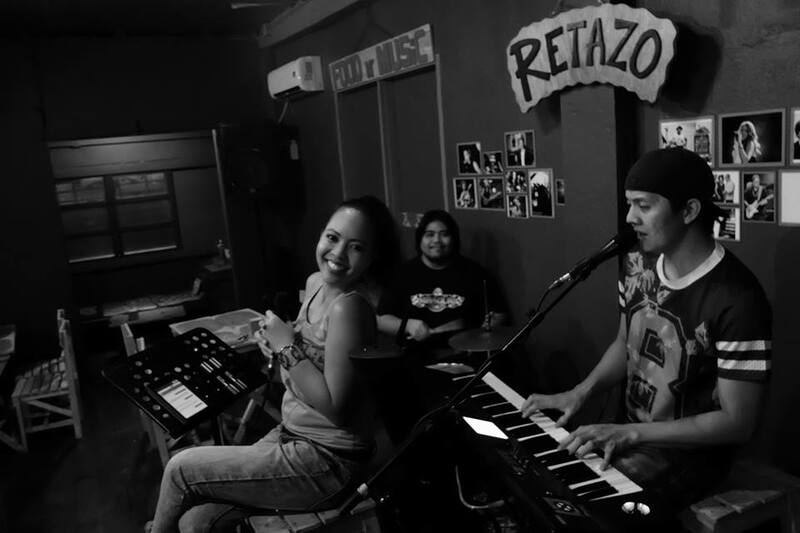 If you are into Jazz, Bossa Nova, Pop R&B, with a touch of Pinoy acoustic sound then this is a must-visit place for you. The food here is good and what makes this place more exciting is that they have an ongoing Man Vs. Food challenge – to finish a humungous spicy beef burger in Ciabata bread, fries, and with Retazo’s signature mango-graham shake in 5 minutes. So far no one has been successful in winning the challenge. Maybe that would be you? 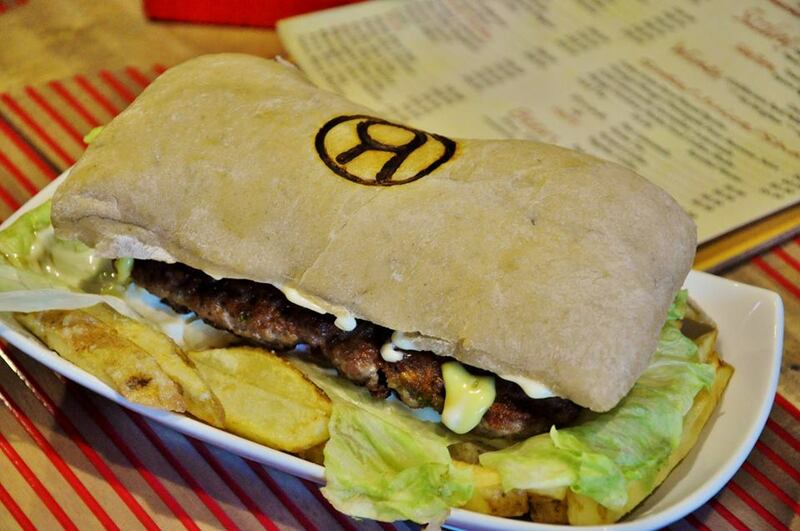 The Retazo Burger is one the diner’s most popular entry in its menu. Pounds and pounds of beef in Ciabata bread is more than enough tickle one’s appetite. What to eat here? The Retazo Burger would be on top of my list and so is their Bicol Express. Okay so this place has one of the best if not the best pancit in town. Take my word for it! Well there is a good reason why this is so. According to the owners they were just originally looking for a place to rent out for a “pansitan” but as luck would have it, they saw a huge space that they can make into a full restaurant. And the rest as they say is history. 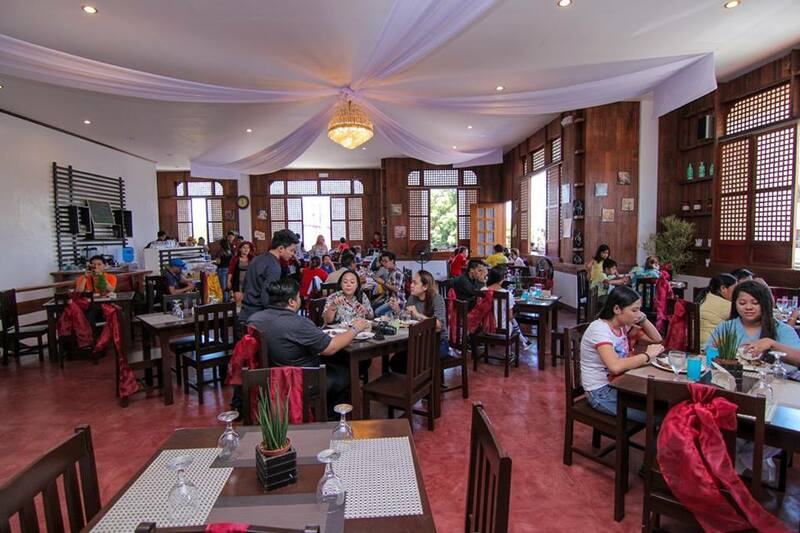 Mamay Fering’s expansive interior makes it a nice place from some intimate events. The food here is top notch and the place is quite classic looking, charming even. This pansitan-turned-restaurant is located in the heart of the city on the second level of a charming building that borrows its looks from a Filipino ancestral home, complete with the hard wood façade and Capiz shell-laden windows. The restaurant has a spacious interior with a sizable covered veranda that opens up to the hustle and bustle of the city below. 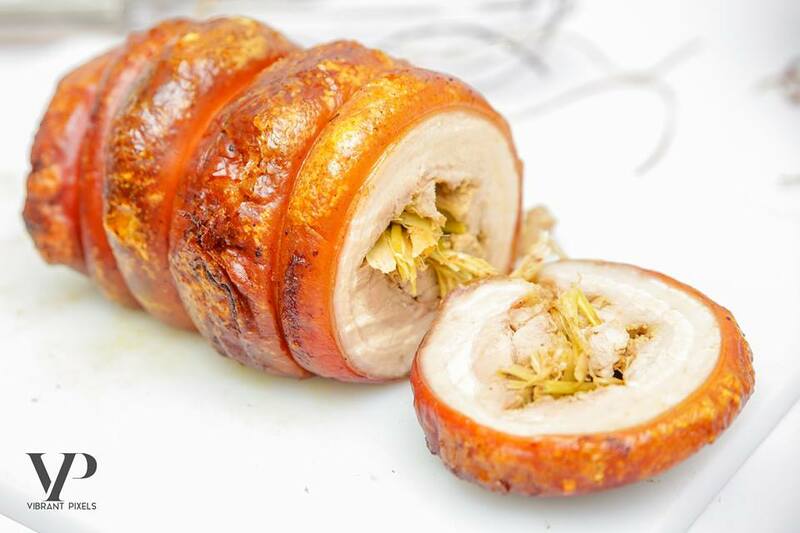 Mamay Fering’s Porchetta is a must try. The spices in the meat and its tenderness is mouth watering. The mixed sea foods in Mamay Ferings is unforgettable. 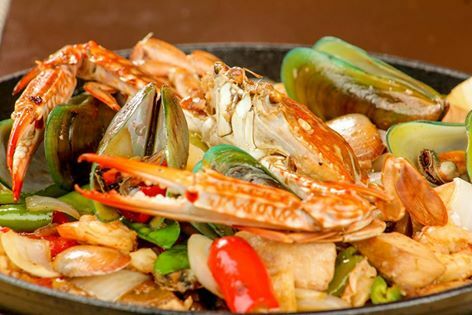 This is one filling dish that should leave a nice memory of your Legazpi visit. What to eat here? The Pancit Canton is a must try of course. The mixed seafoods is also a great choice and so is the legendary Porchetta. Koron is another restaurant that is worth your try when in Legaspi City. 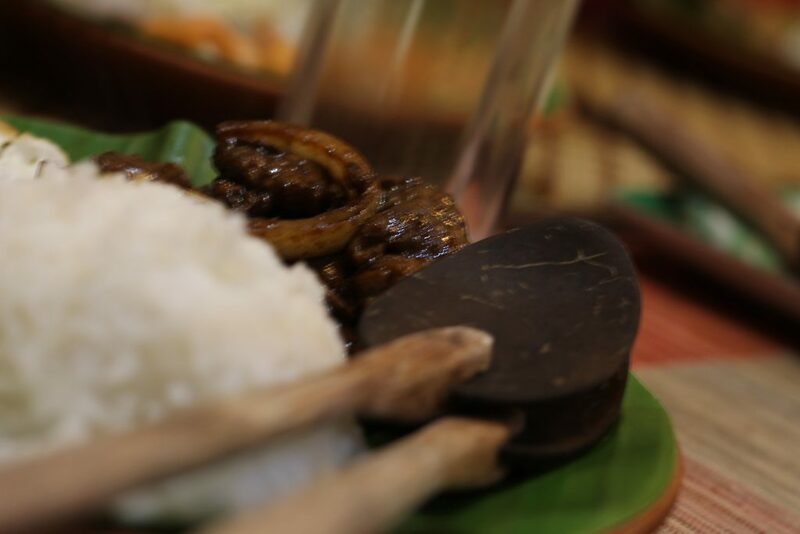 This place boasts of native cuisines, although not exclusively Bicolano. Located in Yashano Mall this restaurant is bound to give you an authentic experience with Filipino food. The Koron offering is authentic Pinoy food. When you eat in this restaurant, the experience is as nice as the food. Everything here is “native” from the food presentation, to the interior décor, to the plates and cutlery. When you eat here bring your camera with you because you would be having fun taking photos of the Koron’s unique way of giving you a taste of Pinoy staple food. Everything in Koron has a native Pinoy touch. The spoon and fork says it all! What to eat here? 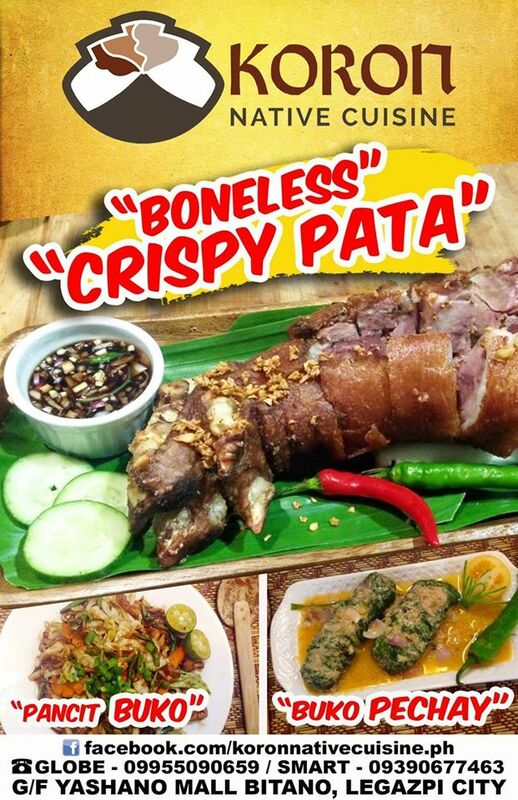 There is the boneless crispy pata, the Kosidong Lapu-lapu, and pancit buko just to name a few. Are you in the mood for some pizza, pasta, or tacos? Then you do not have to go far. In the heart of the Old Albay District of Legazpi City is El Mundo Pequeño, a small restaurant that is big in taste and flavour. El Mundo Pequeño just opened its doors last month but this restaurant is bound to increase its avid diners thanks to its amazingly good food. The Pepperoni Pizza here is oh-so-amazing that I am tempted to say it is the best in the city. It is authentic, thin crusted, with just the right amount of everything. This resto is located in the very same building where the Locsin Pili Nut was in the past few decades. This Pepperoni Pizza is the best in town. Try it to believe it. The restaurant is deceivingly simple from the outside with just a few chairs and tables. But for this resto it is the not the store front that matters, it is the food. Care for some Tacos? This place should be your destination if you are into this Mexican staple food. What to eat here? The meatballs spaghetti is a must-try and also the beef burritos. If you are into authentic Italian pizza and pasta then this is the place to dine to your heart’s content. The offerings of this restaurant is just amazing. 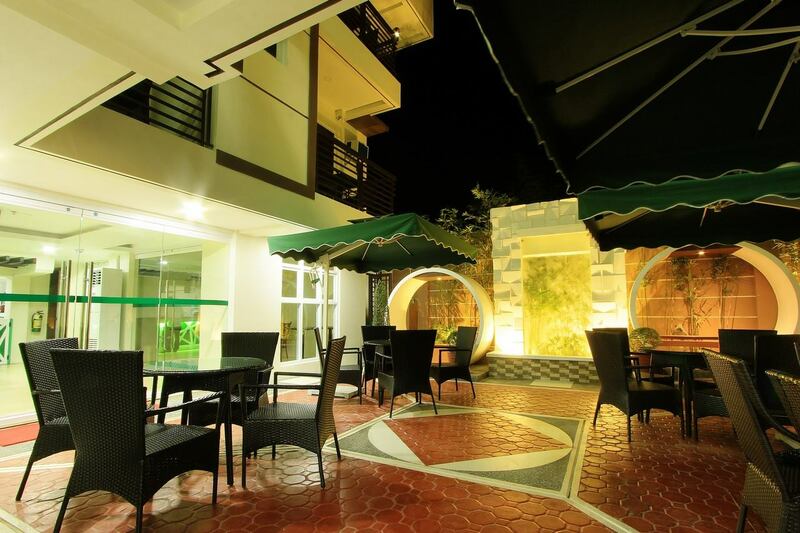 It is a fusion of authentic Italian and Mexican food, a must try when in Legazpi.